Samosa is one of the most popular snacks in India. Here, I am sharing Irani Samosa / Onion Samosa recipe. Deep fried snack made with a savoury filling, such as Onion, Poha, flour and spices. Learn how to make Onion / Irani Samosa at home with this step-by-step guide. To prepare samosa stuffing, add all ingredients in a bowl – Poha, Coriander, Green Chillies, Chat Masala, Red Chilli Powder and Fennel Seeds. Now add Salt, mix again and keep it aside for 5 minutes. Add some water in All Purpose Flour, mix well to prepare a Maida paste. Start folding Samosa Patti in a triangle shape. Add stuffing, fold and seal the samosa with Maida paste. Prepare all samosa in the same way. You can prepare this samosa 1 – 2 hours prior and keep in the refrigerator. Deep fry samosa in oil over medium flame until it turns golden brown. Remove the fried samosas on an absorbent paper. 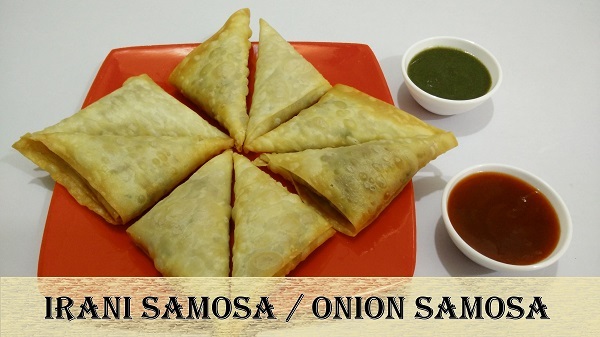 Serve Irani Samosa / Onion Samosa with Chutney or Sauce.